Many new terminals will support both methods, as well as NFC payments via smartphones and smart watches such as the latest iPhones or the Apple Watch, which use Apple Pay. NFC payments are usually done by just touching, or nearly touching, a device to a payment terminal and entering a confirmation on the phone. In addition to “touch and pay” with a smartphone, some retailers like Rite-Aid will support the ability to touch the terminal with a chip card to pay. The chip can communicate a unique encrypted token (or an alias) with the network with your actual credit card number. When the token reaches your bank, it is decrypted so the bank can verify your account and then authorize payment. This all happens in a few seconds or less. Major merchants that are making the conversion and are worried about their new found liability will likely require shoppers to use chip cards after Oct. 1. It isn't clear how much backlash will come from customers who aren't prepared. People who have only magnetic strip cards will probably be permitted to complete their transactions with a normal swipe. In such situations, the liability would fall back onto the bank that issued the non-compliant card, according to Jordan McKee, an analyst at 451 Research. It's possible that some small merchants who have been accepting magnetic strip cards but don't have the ability to process chip cards will stop accepting cards and will insist on payment by cash or check. A number of companies,like Square, sell chip card readers for small businesses, and PayPal is expected to offer one this fall. 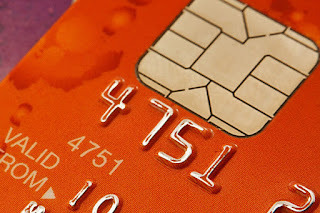 Carolyn Balfany, senior vice president of U.S. product delivery at MasterCard, said in an interview in late June, "We certainly don't think that the consumer should fumble through" using a new chip card. Article originally published by Matt Hamblen - Computerworld on August 12, 2015.